A farmer in a village had a goat and a donkey. The farmer used to make the donkey work hard. He fed the donkey with good food - carrots, radish, corn, etc. The goat was very unhappy since it had to find food by it's own and eat grass. It became very jealous of the donkey. The goat thought of a plan. The goat thought that if the donkey stopped working, it would get the good food the donkey got from the farmer. 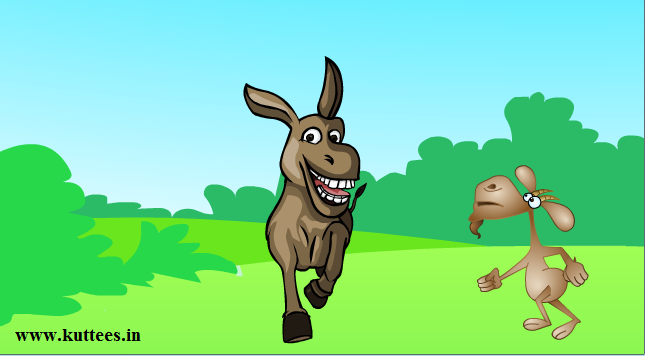 So the goat pushed the donkey into a large hole. The donkey was badly hurt and it could not walk. The farmer became very sad seeing the donkey's bad health condition. He wanted the donkey to recover soon from illness since he had to get work from the donkey. The farmer thought that feeding the donkey with goat's soup might make the donkey recover from illness soon. Hence, the farmer killed the goat and gave the donkey it's soup. So instead of getting the donkey's food, the goat itself became food for the donkey.